Prof. Victor Andres “Dindo” C. Manhit is the Founder and Managing Director of the Stratbase Group and President of its policy think-tank, Albert del Rosario Institute for Strategic and International Studies or the ADRi. Stratbase is a full-service advisory and research consultancy group, specializing in building the relationship of corporate clients with the various sectors of Philippine society to promote their specific interests and address their corporate concerns. For more than a decade, Prof. Manhit and the Stratbase team have been developing innovative and disruptive political and legislative strategies that position clients for success. A well-regarded strategist, he has built winning public affairs campaigns integrating message development, public relations, and the mobilization of grassroots support. With his extensive experience, he helps clients understand the interplay between business and government, and the impact of legislative, regulatory, and electoral outcomes on their business strategies. He also provides top-level strategic analysis and thought leadership on global issues in the Philippines. Concurrently, he is Philippine Country Head of the renowned BowerGroupAsia (BGA), formerly known as BrooksBowerAsia. BGA has an unmatched expertise and experience in helping clients develop strategic expansion initiatives in the Asia Pacific Region. He was a former Chair and recently retired Associate Professor of the Political Science Department of De La Salle University. He has authored numerous commentaries and papers on geopolitical issues, governance and political reforms. Today, he regularly contributes articles and columns to leading newspapers Philippine Daily Inquirer and BusinessWorld. He obtained his Master’s Degree in Public Administration and Bachelor’s Degree in Philippine Studies (major in Political Science and History) from the University of the Philippines. A member of Phi Gamma Mu International Honors’ Society Beta Chapter, he specializes in Strategic Studies and Management, Legislative Research, and Public Policy Analysis. His research interest and field of specialization had led him to pursue active involvement in legislation, bureaucratic work, and civil society advocacy. Among the government positions he held include Undersecretary for External Affairs and Special Concerns of the Department of Education, Culture and Sports and Deputy Secretary for Administration and Financial Services of the Philippine Senate. Meanwhile, his legislative experience encompasses the 8th, the 9th, 10th and the 12th Congress as the Chief of Staff of the late Former Senate President Edgardo Angara and senior policy research adviser in key senate committees, such as Education, Agriculture, Economic Affairs, Social Justice and Electoral Reforms, and Constitutional Amendments and Revision of Laws. Since 1987, he has been involved in all national elections in different capacities, from policy consultancy to campaign strategy. After his stint in government, he became involved with many different consortiums and networks of civil society groups. His civil society agenda range from governance reform to environment stewardship, as Lead Convenor of citizen-led initiative Democracy Watch and Convenor of pro-industry group Philippine Business for Environmental Stewardship or PBEST, respectively. He is also a Fellow at the Foundation for Economic Freedom, a public advocacy organization dedicated to advancing economic and political liberty and other market-oriented reforms. Similarly, his involvement with the distinguished Philippine Trade Foundation is aligned with the group’s commitment toward building a strategic and reformed business environment. As a member and adviser to the Board, Prof. Manhit contributes to the crafting of initiatives geared to attract investments. His international reach is evident in his key role in the establishment of the U.S.-Philippines Strategic Initiative (USPSI) with the Philippine Eminent Persons Group. The trans-Pacific effort underlines the critical linkage of economic ties between the U.S. and the Philippines as a foundation for enduring security relations through research and programs. He is also an advisor to the Board of Asia Society Philippines, another cooperative organization, this time in the area of education. He was recently appointed as one of the ASEAN Regional Forum Experts and Eminent Persons (ARF EEPs) by the Department of Foreign Affairs. Edwin P. Santiago is a faculty member of the Political Science Department of De La Salle University since 1995. He handles courses both in the Political Science and the Development Studies programs of the department. As Executive Director of Stratbase-ADRi, he provides support to the President of the Institute. He is in charge of administration, ensuring the effectiveness and efficiency of its operations, optimizing resource utilization, and establishing and maintaining working relationships with its networks. His interests are in the areas of political economy, public administration, and fiscal administration. At De La Salle University, he also occupied several administrative positions including Vice President (Vice Chancellor) for Administration from 2013 to 2016, Associate Vice Chancellor for Academic Services from 2008 to 2013, University Registrar from 2001 to 2013, Chair of the Business Management Department from 2003 to 2004, Vice Chair of the Political Science Department from 2000 to 2001, and Chief Administrative and Finance Officer of the Social Development Research Center, from 1998 to 2000. In the government, he has held such positions as Head Executive Assistant (with the rank of Assistant Secretary) in the Office of the Secretary of Finance in 1998, Consultant in the Department of Budget and Management from 1991 to 1998, and Consultant in the Philippine Amusement and Gaming Corporation from 1996 to 2001. Since 2002, he is a Fellow at the Yuchengco Center where he writes policy briefs and occasional papers. He maintains his active consultancy practice in the fields of service operations management and higher education administration. Mr. Santiago was an Exchange Fellow at the Sophia University in Tokyo in 2009 and at Fordham University in New York City in 2007. He is currently a candidate for the degree Ph.D. in Development Studies at De La Salle University, where he also obtained his Master of Business Administration degree in 1997, and his degrees in Bachelor of Science in Commerce major in Accounting and Bachelor of Arts in Political Science, both in 1989. He is a Certified Public Accountant. Maria Claudette Guevara is the Deputy Executive Director for Programs of the Stratbase ADR Institute. Likewise, she is the Accounts Director of the Stratbase Group in which she ensures the delivery of work on behalf of clients to navigate and shape complex legislation and regulatory policy affecting critical client interest. She helps manage strategic grassroots campaigns on behalf of Stratbase clients. She works across the firm to identify opportunities, build teams, and engage in strategic planning and execution of Stratbase public affairs projects. She also acts as point person on the Group’s event strategy practice, developing and producing creative events for corporate clients and non-profit partners. She is also the Secretary General of ADRi’s advocacy group, Democracy Watch Philippines, a citizen-led initiative that advocates for honest, fair and free elections, reforms to strengthen political party systems, and institutionalizing governance reforms through the principles of accountable government and transparency of decision-making. She received her bachelor’s degree major in Political Science from De La Salle University-Manila in 2011. She took a course on Leadership of Change for Development Managers at the Asian Institute of Management on May 2017 and a course on Project Management from Ateneo De Manila University Continuing Center for Education in 2015. She was a delegate at the Southeast Asian Young Leaders Program of the International Institute for Strategic Studies’ Shangri-La Dialogue 2018. She was elected as a two-time Batch President of the College of Liberal Arts at the De La Salle University from 2008 to 2010 and Sangguniang Kabataan Chairperson in Pasay City, Metro Manila. She was also the High School Student Council President from 2007-2008 at the St. Scholastica’s College-Manila. Jaime M. Jimenez is a Deputy Executive Director for Research and the Head of the Editorial Board of the Stratbase ADR Institute. He received his Bachelor’s degree in Political Science at De La Salle University in 1994, graduating with a Gold Medal for Academic Excellence. 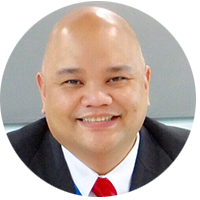 In 1998, he received his MA in Philippine Studies at De La Salle University and earned his Doctorate degree in Southeast Asia Studies at the National University of Singapore in 2003. Krystyna Louise Dy is the Social Media Manager of the Stratbase ADR Institute. As the Institute’s digital strategist, she ensures that ADRi is part of online conversations that are relevant to its Programs. She launches websites and helps the Institute’s Projects maintain online communities by developing social media content and designing and executing social media plans. She was also the Chief of Staff of the Stratbase Group, and was the National Youth Coordinator of Democracy Watch Philippines. In 2010, she was elected as the President of the Sangguniang Kabataan (Youth Council) Provincial Federation of Isabela, earning her a seat at the Provincial Board. She concurrently served as the Treasurer of the Sangguniang Kabataan National Federation until 2013, where she took an active role in pushing for the reform of the Sangguniang Kabataan through her participation as resource person in a series of technical working group hearings at the Philippine Senate. The outcome, then called the Youth Development and Empowerment Act of 2014, was signed into law by former President of the Republic Benigno Aquino III in January 15, 2016 as Republic Act No. 10742. She received her Bachelor’s degree in Political Science at De La Salle University in 2014, where she was a member of the Political Science Society (POLISCY), the oldest political organization in the university. Weslene Irish Uy is the Economic Fellow of the Stratbase ADR Institute. She produces some of the Institute’s publications including Economic Snapshots, a quarterly update on the latest economic developments in the country, as well as its bi-monthly political-economic risk brief. She is also a regular contributor to “Thinking Beyond Politics” an opinion column of BusinessWorld, where she writes mostly about the key pillars of this administration’s economic agenda– its comprehensive tax reform program and infrastructure drive. She was the Research Manager of the Stratbase Group, where she oversees the firm’s sectoral monitoring. Prior to joining ADRi, she was a technical assistant under the Performance and Projects Management Office of the Office of the Cabinet Secretary. She received her Master’s in Development Economics from the University of Sussex in 2014, and is pursuing another Master’s in Urban and Regional Planning at the University of the Philippines, specializing in public works planning. Patricia Paula B. Ruivivar is Senior Research Associate of the Stratbase ADR Institute where she assists in client-related deliverables and handles sectoral research for power and energy and infrastructure. Concurrently, she is a Program Officer of consumer advocacy group, CitizenWatch Philippines. Prior to joining Stratbase, she was a Research Specialist for Makati Business Club (MBC) from 2014 to 2016. She served as the alternate to the Executive Director in various membership engagements such as the Open Government Partnership Philippines’ Steering Committee and The Anti-Corruption Working Group of the National Competitiveness Council. In 2016, she was a Project Associate of USAID-i3, tasked to support the legislative priorities and advocacies of USAID-i3’s public sector partners. She was involved in various activities per government partner, such as in the efforts of the Securities and Exchange Commission to repeal the Bank Secrecy Law; the development of the online whistleblowing platform of the Government Commission for GOCCs; and the creation of an inter-agency Memorandum of Agreement on case referral between the Office of the Ombudsman and the Civil Service Commission. She has organized and attended trainings on Regulatory Enforcement Policies and Practices by the United States Securities and Exchange Commission, Effective Investment Fraud Investigations by the Independent Financial Integrity Consultants, and other various trainings sponsored by Deloitte Consulting on risk management, strategic communications, and gender and development. In 2014 she graduated with honors from De La Salle University with a Bachelor of Arts in Development Studies degree. Bianca V. Suarez is a Research Associate of Stratbase ADR Institute. She supports strategic risk identification and monitoring of political movements ranging from sector-specific issues, and international issues. She assists in the collation of data and preparation of the Institute’s activities. She is also a Program Officer for Democracy Watch Philippines, a citizen-led initiative that advocates for honest, fair and free elections, reforms to strengthen political party systems, and institutionalizing governance reforms through the principles of accountable government and transparency of decision-making. She graduated with a degree in Political Science from De La Salle University, Manila. In the university, she served as the Managing Editor and News Writer for The LaSallian, the student newspaper of the university. She also represented the university twice in the National Model of United Nations (NMUN) in Washington D.C., USA and Kobe, Japan. Both times, she was awarded as best delegate and part of an award-winning delegation. Outside the university, she was the executive director of the Philippine Model Congress, the premier legislative simulation of the country, from 2016 to 2017. Prior to joining Stratbase ADR Institute, she was connected with Colegio Argentina Benferri based in Spain. She was also a policy intern in Pampubliko, a start-up political think tank, wherein she drafted policy briefings and analysis on various issues. Rainiel Joyce M. Aquino is a Research Associate of Stratbase ADR Institute. Her previous experience involves comprehensive business and economic research. While with Stratbase ADR Institute, her duties include monitoring of a variety of regulatory and political stories concerning specific sectors. Likewise, she contributes for the Institute’s publication, Economic Snapshots, a quarterly update on the latest economic developments in the country. Concurrently, she serves as Accounts and Research Associate for the Stratbase Group and the Program Officer for the Philippine Business for Environmental Stewardship (PBEST), an environmental non-government organization. She earned her bachelor’s degree in Agricultural Economics major in Agricultural Marketing and Prices from the University of the Philippines Los Baños. While in the university, she had engaged in socio-civic activities through joining Circle K International of UP Los Baños, an international student-led service organization, where she served as a member of service committee. In addition, she also volunteered for UPLB Pelikulab, a media arts division of Samasining under the Department of Humanities of the university. Jaime M. Jimenez is Deputy Executive Director for Research and the Head of the Editorial Board of the Stratbase ADR Institute. He received his Bachelor’s degree in Political Science at De La Salle University in 1994, graduating with a Gold Medal for Academic Excellence. In 1998, he received his MA in Philippine Studies at De La Salle University and earned his Doctorate degree in Southeast Asia Studies at the National University of Singapore in 2003. Dr. Renato Cruz De Castro is a full professor in the International Studies Department, De La Salle University, Manila, and holds the Charles Lui Chi Keung Professorial Chair in China Studies. In 2016, he was a U.S.-ASEAN Fulbright Initiative Researcher from the Philippines, based in the East-West Center in Washington. He is an alumnus of the Daniel Inouye Asia-Pacific Center for Security Studies in Hawaii, U.S.A. In 2009, Dr. De Castro became the U.S. State Department ASEAN Research Fellow from the Philippines and was based in the Political Science Department of Arizona State University. He earned his Ph.D from the Government and International Studies Department of the University of South Carolina as a Fulbright Scholar in 2001, and obtained his B.A. and two master’s degrees from the University of the Philippines. Professor De Castro has conducted several courses on International Relations and Security Studies in the National Defense College and Foreign Service Institute. He is also a member of the Board of Trustees of the Stratbase Albert del Rosario Institute (Stratbase ADRi). A consultant in the National Security Council of the Philippines during the Aquino administration, Professor De Castro’s research interests include Philippine-U.S. security relations, Philippine defense and foreign policies, U.S. defense and foreign policies in East Asia, and the international politics of East Asia. He has written over 80 articles on international relations and security that have been published in a number of scholarly journals and edited works in the Philippines, South Korea, Canada, Malaysia, France, Singapore, Taiwan, Germany, the United Kingdom, Australia, and the United States. The ADRi Board of Trustees is composed of notable figures from premier educational institutions and industry. The Trustees provides guidance and direction to the numerous policy studies and advocacies that the Institute advances. ADRi’s four programs are convened by Dr. Francisco Magno, Dr. Carlos Primo David, Dr. Renato De Castro, and Dr. Epictetus Patalinghug. ADRI’s quarterly Spark and monthly occasional papers are authored by a variety of specialists in their given fields, in accordance with the objective of each program.